If you wish to give your child an ideal place for doing homework, reading, writing and studying, then the KidKraft - Star Table and Chair Set will be a good choice. This table chair set is made from natural wood and is rectangular in shape, offering maximum working space. The chairs feature red and blue lacquer for attractive looks. Both the table and the chair have whimsical star cut outs that kids will love. This kid's wood table and chair set also features built-in bins for storage purposes. There are four storage bins and each one is differently colored in red, blue, green and yellow. These storage bins are placed at a tilted angle below the table for easy access from either end of the kids table and chair set. This KidKraft - Star Table and Chair Set offers both functionality and comfort for your kids studies. 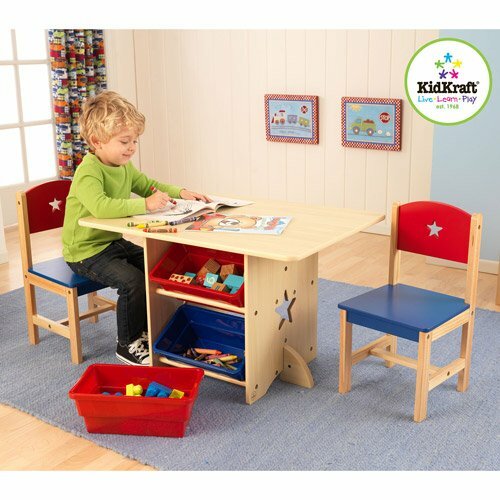 With the KidKraft table and chair set, your children will finally have a place to sit and enjoy their studies. KidKraft Star Table and Chair SetNatural wood rectangular table is the perfect place for homework, studying, reading or creating masterpiecesBuilt-in storage bins in patriotic red and blue are easy to reach from either end of the kids table and chair setConveniently tilted for easy access to markers, papers or arts and craftsTwo chairs are finished in a combination of natural wood and red and blue lacquerBoth the kids wooden table and chairs have star-cut-outs so your child can study like a true star!